One of my main beefs with big box stores is the way corporate bean counters have taken away local and regional discretion on ordering books for a store. There once was a time when a store manager could place an order for multiple copies of a book to be sold at that store because a local author sold well. Those same managers could order enough books for a teacher’s class if needed — and without the teacher having to pay up front. But those days are, for the most part gone. Worse, an Alaskan author has been caught in the middle of the world v. Amazon battle — and no one is standing up for that author against BN because, duh, Amazon is involved. Would no longer be available on their shelves. NO LONGER BE AVAILABLE. Sigh. So, a book they had been selling, a book that was nominated for a National Book Award last year, has been removed from the shelves. A book written by a popular local author has been removed. A bookd the Anchorage B&N manager said had been doing well. Why? Because the publisher was purchased by Amazon. No other reason except it is now tainted by THE EVIL THAT IS AMAZON. And no one is up in arms about this. No writers are hitting social media condemning Barnes and Noble for taking income away from an author, from keeping reading material out of the hands of the buying public. But the thing that really has me shaking my head is that BN has forced stores to remove a book from the shelves that was selling well, at least locally. And then they want our sympathy for their economic problems. Sorry, that dog don’t hunt. That would be like a coffee grower burning down part of its crop just because the plantation next to it was growing the same type of beans. Understand, Amazon wasn’t taking this title as an exclusive. In fact, there is news today that Amazon’s latest line of e-books will not be exclusive only to Amazon. Now, before you claim I’m applying a double standard here, I’m not. B&N has the right to choose what books it will and won’t sell. Just as Amazon does, even though the lemmings I’ve written about earlier don’t think so. However, my beef is with the policy that prevents a store manager from being able to order books for the local buying public that help make money for the store. My beef is with the double standard being presented by a certain group of writers who are so quick to condemn Amazon for not “doing right” by authors but they don’t hold the big box stores to the same standard. So, my recommendation is to take a look at Ms. Edwardson’s book in hard copy and on the kindle. In fact, here’s a link to it on Amazon. Why Amazon? Because I’m contrary. the second Monday of the week? It feels that way. After a weekend filled with fun guests — and the massive and manic cleaning beforehand — and finally some rain, yesterday dawned with a new week’s worth of things to do, both personally and professionally. Part of it was deciding how to handle my various blogging responsibilities. Like so many writers and other folks in the publishing industry, I find myself active on more than just one blog. That often winds up cutting into my writing time. So, decisions needed to be made. Basically, I’ll be blogging at The Naked Truth Mondays, Wednesdays and Fridays. I do my turn at Mad Genius Club every Sunday and the occasional Saturday. That leaves Tuesdays, Thursdays and Saturdays here. Mind you, that is all subject to change as scheduling and breaking news dictates, especially for this blog and The Naked Truth. But, it’s what I’m going to try for. . . we’ll see how it works. Another thing I think I’m going to try is a regular snippet schedule. It will keep me focused on my writing which is, I’ll admit, taking a backseat all too often to my duties at NRP. So, I think I’ll start that today. However, what isn’t going to be snippeted is the super sekrit project, mainly because I don’t know where it is going just yet. Also, snippets will be rough, very rough, and will most likely change between when they appear here and in the final product. Also, because of the problem of making sure the work being snippeted isn’t “published” before I get around to submitting it, snippets may not always be in order and I will never snippet more than 1/4 – 1/3 of the novel. However, if you’re really interested in it, you can email or leave a comment asking to be a beta reader. As any writer will tell you, beta readers are invaluable. So, now to decide what to snippet, especially since I have dueling books in my head right now. While I think about that, pardon me while I squee again. Nocturnal Origins is doing pretty good so far as an e-book. Actually, I’m thrilled with the preliminary numbers I’m seeing, but would, of course, love them to be better. What author doesn’t? And I’m absolutely ecstatic about the reviews it’s gotten so far. I have to give a special shout out to Barb Caffrey at Shiny Book Review and say thanks for her review. But the squee is for the fact the print version of Nocturnal Origins is now available (TPB). You can order it from Amazon here. It will soon be available from Barnes & Noble and you will be able to order it from your local bookstore as well. There really is a special feeling to know your book is available in print. I guess I’ll go figure out what to start snippeting. Snippets will begin Thursday. 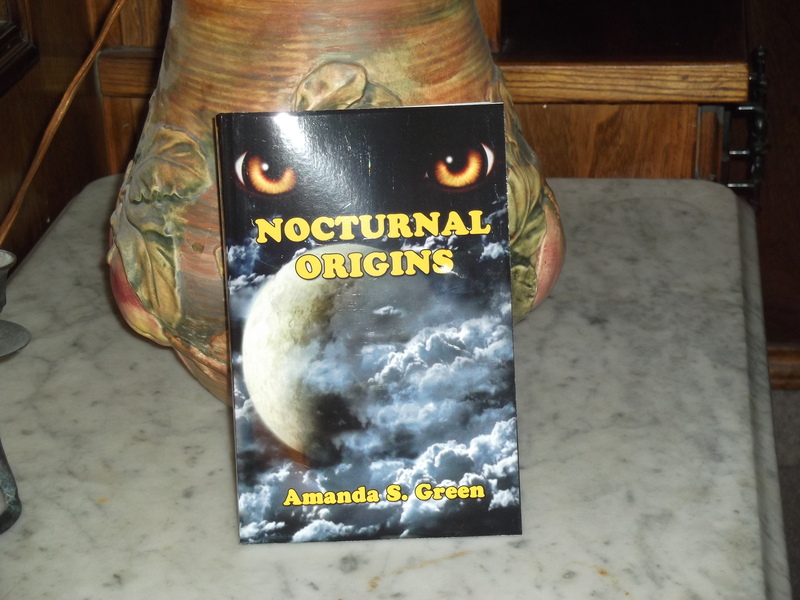 In the meantime, if you’ve read Nocturnal Origins and enjoyed it, please tell your friends. I’m a firm believer that word of mouth really is the best advertising any author can get.